Chlorella vulgaris is an asexual, unicellular green alga. It has been observed in the laboratory to maintain unicellularity for thousands of generations. Boraas and his collaborators (1998) kept Chlorella for two decades in this way. Then they decided to add a predator, Ochromonas vallescia, also a unicellular organism. It has a flagellum (a tail with which it can swim about), and it eats Chlorella. This is bad news for the Chlorella population, which thus experiences a shift in selective pressure. While it was previously adapted to maximize growth by uptake of nutrients, with Ochromonas around it is suddenly more advantageous to have some sort of defense, even if that should come at a cost of the rate at which it can reproduce. While we could imagine other mechanisms of defense, size is an obvious choice. Very soon (about 10 days) after the introduction of the flagellate predator, Chlorella colonies started to form. These initially consisted of aggregates of tens to hundreds on Chlorella cells, adhering to each other. Their sheer size prevented the predator from eating them, and thus the multicellular Chlorella was fitter than the unicellular ones, and as a result the unicellular Chlorella all but disappeared. Multicellularity had evolved right before the lucky scientists' eyes. Single Chlorella cell (FC), Chlorella colony (CC), and the flagellate predator, Ochromonas (Oc) with its flagellum (Fl). Recall that Chlorella is better able to utilize the nutrients in the environment when they are single cells. Thus, the colonies of tens to hundreds of cells soon disappeared, replaced by colonies of of only eight cells. This seems to be the optimal size for uptake of nutrients and defense against Ochromonas. When Boraas et al. removed the predator from the environment, Chlorella colonies continued to make multicellular offspring. However, with the selection pressure to be large gone, the unicellular Chlorella took over again. The significance of this experiment is that it lends support to the hypothesis that a predator-prey arms race could provide the needed environmental change to enable multicellular organisms to evolve. It also is an outstanding example of observed evolution in the laboratory. It can be argued that the unicellular and multicellular Chlorella are different species, and this is then also an example of speciation observed. 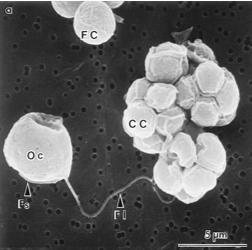 Now contrast this Chlorella with the famous E. coli experiment by Blount et al. reported in PNAS this year. In short, after years of culturing E. coli bacteria in the lab, they one day evolved the capacity to metabolize a new nutrient, citrate. Scientists use E. coli's inability to metabolize citrate to distinguish it from other bacteria, so the fact that they suddenly evolved the ability to eat it can also be argued to be an instance of speciation. However, there is a clear difference from Boraas' experiment, namely that Chlorella evolved almost instantly when the selection pressure changed. It thus responded to the change on the basis of standing genetic variation: different genotypes present in the population. There were already some Chlorella cells that were able to adhere to their daughter cells, but it was unfavorable to do so until the appearance of predators. In Blount's experiment it was always favorable to consume citrate. There was plenty of it, and E. coli was deliberately starved on its usual nutrient. Yet they had to wait 30 years to observe E. coli evolving to eat citrate, because the genetic components enabling them to do so had to evolve first. A yet unknown sequence of necessary mutations was required, and once it appeared, E. coli speciated. The Chlorella experiment is referenced in chapter 7 of Your Inner Fish by Neil Shubin. This is a really interesting paper on a very exciting topic. The evolution of multicellularity is maybe one of the most understudied major transitions in the evolution of organisms. Thanks for the interesting post! Andrew Knoll of Harvard is one person who knows something about the subject. Andrew Knoll: "Life on a Young Planet"
"Biology and the Environment: Past, Present and Future." Andrew Knoll, Fisher Professor of Natural History at Harvard University. Lecture followed by a dessert reception. Is a colony considered a multi-cellular organism? Good question. I would not think so. Rather, the colonies could be imagined to be the first step towards evolving real multicellularity ('an organism that reproduces by making a copy of the whole, and consists of different types of cells'). The chlorella formed colonies. So the Boraas experiment does not show the evolution of multi-cellularity. Right? It shows the evolution of colonies. Sure it shows the evolution of multicellularity. Multicellular colonies. But no multicellular organisms evolved in this experiment (at least according to how I would define 'organism'). However, in the evolution of those, this is clearly a first and hugely important step. We have now established that the experiment did not show the evolution of multi-cellular organisms. "It can be argued that the unicellular and multicellular Chlorella are different species". Are you saying that it can be argued that the multi-cellular chlorella colony is a different species than the unicellular chlorella? If something becomes a colony you can argue that it is a new species? We have now established that the experiment did not show the evolution of multi-cellular organisms. No, we have only established that I would not call the multicellular Chlorella an organism. The experiment shows how one important step in the evolution of multicellularity could have occurred, and perhaps can occur, eventually leading to multicellular organisms (the way I defined them above). Are you saying that it can be argued that the multi-cellular chlorella colony is a different species than the unicellular chlorella? If something becomes a colony you can argue that it is a new species?Yes and yes. When an organism evolves to fill a new niche, then it is, by definition, a new species. And the environment with a predator on unicellular Chlorella is a new and different environment. Would you reveal your name? "We have now established that the experiment did not show the evolution of multi-cellular organisms." "No, we have only established that I would not call the multicellular Chlorella an organism." And you are right to do so. The chlorella "colonial organism" is not a "multicellular organism" as those words are defined. A colony of single-celled organisms is known as a colonial organism. Multicellular organisms are organisms consisting of more than one cell, and having differentiated cells that perform specialized functions in the cell. the experiment did not show the evolution of multi-cellular organisms. This is a correct statement by the definition of "multicellular organism." "differentiated cells that perform specialized functions in the cell." Are you going to be playing these words games all the time? Or is it that you are not used to being precise with your terms. And I do not "believe" in things. I go where the evidence leads. I beg your pardon? You are the one who started playing with words. You apparently set out to make the distinction between colony and organism. I think you are right to do so, but why the hell accuse me of playing with words? I, of course, mean 'believe' as in 'having confidence in based on the evidence', rather than 'faith despite the evidence'. Didn't you just accuse me of playing with words? Where does the evidence lead you, then? Your posts are misleading. You use the word "multicellularity" when you are just talking about the forming of a colonial organism. See the Wikipedia entries for the difference between colonial organism and multicellular organism. "Multicellular organisms are organisms consisting of more than one cell, and having differentiated cells that perform specialized functions in the cell." differentiated cells that perform specialized functions in the cell. It is not "multicellular" in the common definition of the word. "..and thus the multicellular Chlorella was fitter than the unicellular ones, and as a result the unicellular Chlorella all but disappeared. Multicellularity had evolved right before the lucky scientists'eyes". This is an incorrect statement using the common definition of "multicellular". and thus the colonial Chlorella was fitter than the unicellular ones, and as a result the unicellular Chlorella all but disappeared. A colony had evolved right before the lucky scientists' eyes. "The significance of this experiment is that it lends support to the hypothesis that a predator-prey arms race could provide the needed environmental change to enable multicellular organisms to evolve." The significance of this experiment is that it lends support to the hypothesis that a predator-prey arms race could provide the needed environmental change to enable colonial organisms to evolve. These are huge and important distinctions. Even your title is misleading. It should say "Watching colonies evolve before our eyes". The idea is that forming colonies is a first step toward evolving multicellular organisms. See Colonial Theory. No one is claiming that this experiment and forming multicellular colonies is all there is to it. You: And I do not "believe" in things. I go where the evidence leads. Me: I, of course, mean 'believe' as in 'having confidence in based on the evidence', rather than 'faith despite the evidence'. Didn't you just accuse me of playing with words? Where does the evidence lead you, then?Let me hear you answer. The evidence does not lead to Darwinism. Nor does it lead to Intelligent Design. Nor does it lead to Creationism. Why do you think thousands of evolutionary biologists believe the evidence leads to evolution? It leads me to be open minded. The complexity of the cell at the molecular level could not have been developed through random mutation. Even if we overlook irreducible complexity, just the intricacy of the structure and the processes could never be the result of accidental, random gene mutations. To think that way, is as odd as thinking that a complicated factory could be constructed through random actions. Those are of course very common ID/creationist talking points. But, 'open minded' is not a theory. Have you made up your mind as to what you believe the origin of the cell is, if neither evolution nor creationism? No. But random mutation could not have done it. That much is clear. A theory based on random mutation is not reasonable. If such a theory were raised today for the first time with everything we know today about molecular biology, nobody would accept it. I am supremely interested in your thoughts on what other possibilities there are. People routinely dichotomize the issue, because no one has thought of anything else. Got something? I'll be happy with even the smallest of smithereens. Take a look at "natural genetic engineering". molecular computation network demonstrating biologically useful properties of self-awareness and decision-making." Thanks for the link. I have already been looking into NGE, and had found that paper and others by Shapiro. I am planning a separate post about the subject, hopefully sooner than later (though other things get in the way). "No. But random mutation could not have done it. That much is clear. A theory based on random mutation is not reasonable. " " It leads me to be open minded. "